April 15, 2010 By Bob Pilgrim & filed under All Articles, Handguns, Weapons. 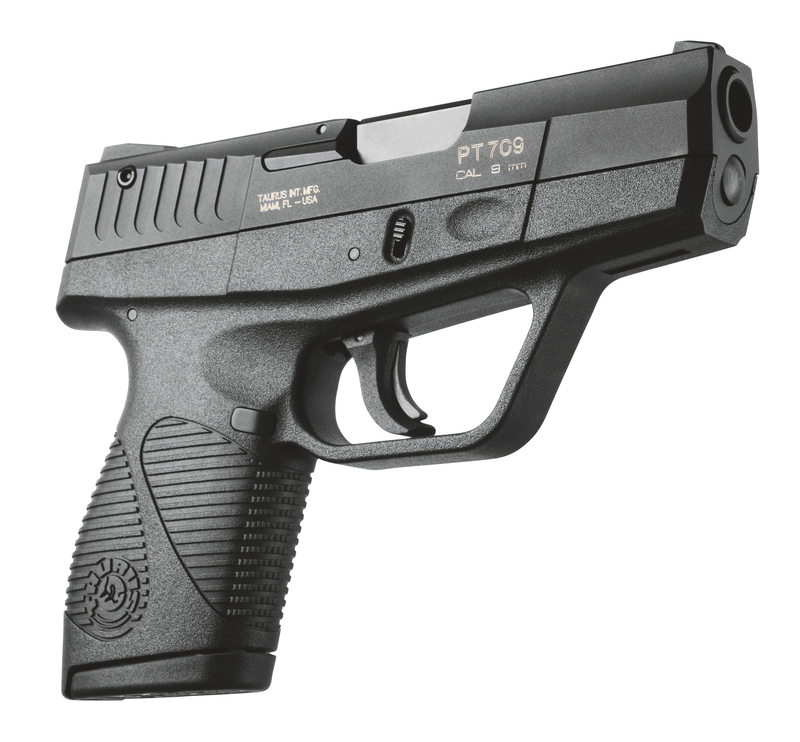 As one competitor of Taurus has opined, “Slim is in.” The sub-compact Taurus PT 709 series certainly provides an individual with that currently coveted attribute in three different metallurgical formats. The frame is lightweight polymer, but slides can be acquired in carbon and stainless steels and Titanium. The relatively flat single stack with 3.27-inch barrel weighs a little more than a pound empty in its steel configuration, but sheds two more pocket-sagging ounces with its Titanium mantle. With standard and extended magazine capacities of 7+1 or 9+1 of 9x19mm respectively, the 709 exhibits fire sustainability well beyond the 20.4-ounce, five-round snub revolver in an overall superior package. 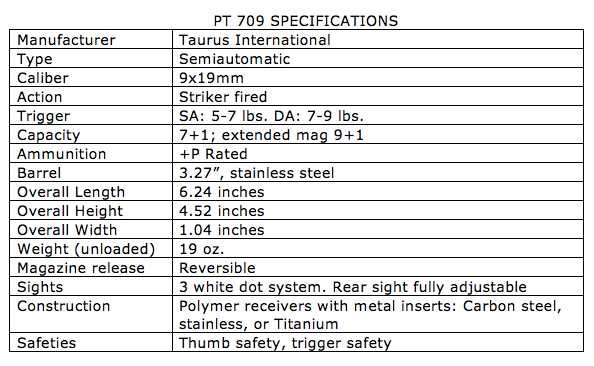 Right side of Taurus PT 709. The Kel–Tec PF-9, which appears to be the industry standard for small, ultra-light but powerful pistols, is considerably lighter at 12.7 ounces empty, has a similar standard ammunition capacity but is not rated for +P ammunition. SAAMI specifications for standard and +P 9×19 Parabellum are 35,000-38,500 PSI respectively. There are no SAAMI standards for +P+, but the Taurus handled three examples with no visual evidence of deleterious effects. Obviously, in size and weight, the Taurus is a more substantial firearm than the Kel–Tec and, although sustained and continuous use of “hot” ammunition that exceeds the outer limits of SAAMI specifications will induce wear at an accelerated rate, it is my experience that Taurus pistols will digest the stoutest commercial hollowpoints without complaint. Left side of Taurus PT 709. When I shook hands with the tiny Taurus, it filled my big mitt reasonably well. However, my pinky seemed to naturally gravitate to the underside of the magazine base plate, as it does when shooting J-frame Smith & Wesson revolvers with factory grips. In the past, pistols of these diminished dimensions were relegated to straight blowback actions and consequently forced to accommodate lower-powered cartridges. Now with short recoil, locked-breech actions and advanced recoil springs incorporated into these compact designs, more serious defensive calibers can be integrated into fist-sized handguns. Today the 9mm Parabellum with a properly designed bullet is an extremely effective caliber and is a natural for the PT 709. The 709’s unique feature is its single-action (SA) transition to double-action (DA) trigger—not the other way around. When the slide is cycled and the round chambered, the striker is compressed. All the trigger has to do is release the sear holding the compressed striker in check. If a failure to fire occurs, a relatively smooth and light double-action restrike of the primer can be initiated by merely pulling the trigger. Although Taurus cites research that indicates there is a 93% chance of stubborn primer ignition on the second slap, some professional gunmen decry the restrike feature as potentially wasting precious survival time, especially if the cartridge is a dud. They prefer to take immediate action and jettison the problem round. The nice thing about the Taurus is that it gives you two choices on how to solve your problem. The SA trigger has a bit of take-up before sear resistance is felt and breaks after approximately .38” of movement. The DA trigger features little slack. Resistance is smooth and consistent throughout the stroke’s .48” arc of travel. Some DA fans have reported that they actually prefer the restrike trigger to the first strike trigger. With practice, you can accelerate through the initial SA slack and stage the trigger before experiencing a tiny bit of creep just before the break. Rapid-fire trigger control is very good. Although the factory rates the DA pull as being two pounds heavier than the SA trigger, both triggers on my sample broke at about six pounds. PT 709 with Benchmade Harley Davidson Mini Hardtail folder. 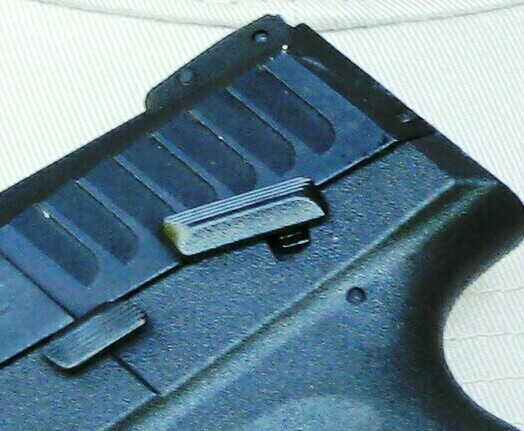 Point in safe direction, remove magazine, clear gun and lock slide to rear. Inspect chamber to determine if clear. Move slide to rear approximately 1/8 inch and pull down disassembly latch. While holding it down, push slide forward and remove from frame. There is no need to pull trigger. Release recoil spring and remove. Remove barrel by sliding it forward and pulling it up. 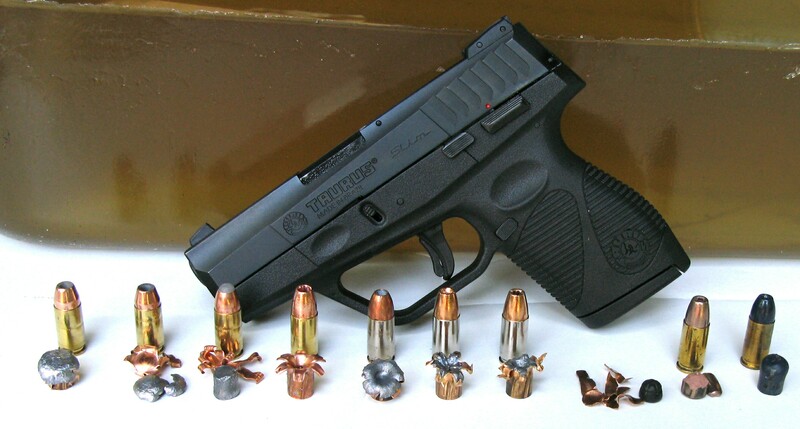 Taurus recommends cleaning the pistol, including the magazine, after every 200 rounds fired. PT 709 has manual thumb safety as well as trigger safety. This is an amazing little pistol. Of course it barks and jumps with stout defensive loads in it, but it was 100% reliable when I fed it 19 different loads ranging in weight from 90 to 147 grains. I think the tiny Taurus will eat anything you have on the shelf. One of the attractive things about the modern Parabellum cartridge is that it can be obtained in a plethora of configurations, weights and velocities. These enable the perceptive shooter to find the best round for his gun that balances reliability, recoil, muzzle blast/flash and accuracy with effective terminal ballistic performance. Off-hand accuracy is combat effective and, in spite of the pistol’s short sight radius, I was able to make head shots on a silhouette target at 25 yards. Absent a barrel bushing, front-end lock up is enhanced by increasing muzzle diameter relative to overall barrel circumference. The port-side thumb safety is long and narrow but operationally intuitive, and it collaborates with redundant trigger and internal firing pin safeties and a dorsal loaded-chamber indicator. PT 709 with various bullets recovered from Perma-Gel. Although this is a true point-and-shoot gun that, like Glock pistols, can be carried relatively safely with the manual safety disengaged, I don’t recommend it, especially if it’s carried in a fanny pack or pocket where the pistol can move around. Learn to wipe the thumb safety off when presenting the firearm and establishing your firing grip. It will not slow you down. For storage, or for some specious reason the gun is left unloaded and unattended, Taurus’ key-activated trigger/striker locking system renders the gun inoperable. Within 15 feet, double taps and burst shooting with one or two hands are quite controllable, and this lightweight pistol behaves well even with +P+ ammunition. I focused on front-sight shooting and then switched to point shooting with the fully adjustable sights taped over. At interrogation ranges, triple-tap groups actually improved slightly when I abandoned the sights, focused 100% on the target and just looked through the gun while letting her rip. The PT 709 is an ideal second or back-up gun. With an upgraded hollowpoint like the new Winchester Type “T,” it will get the job done as long as the shooter does his part and punches holes in vital areas. 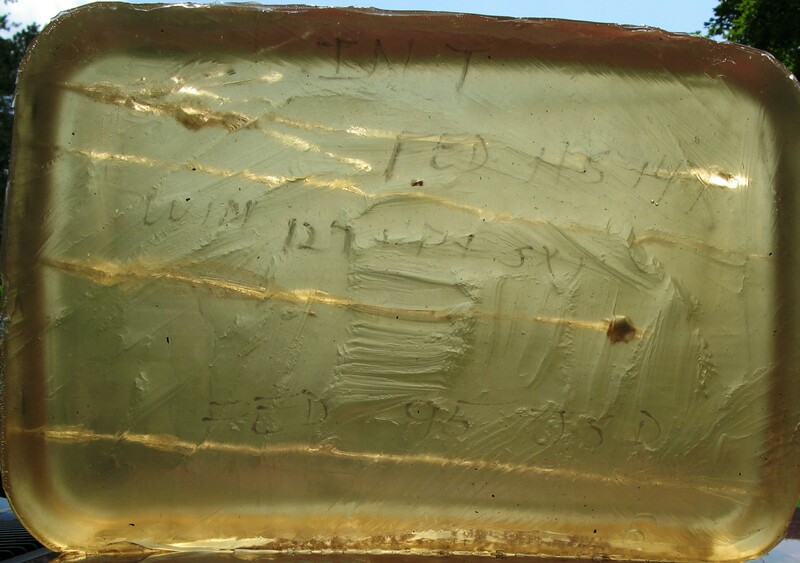 Close-up of PT 709’s slide. To determine what would be the best defensive loads for the PT 709, I pumped 14 different rounds into Perma-Gel test media. 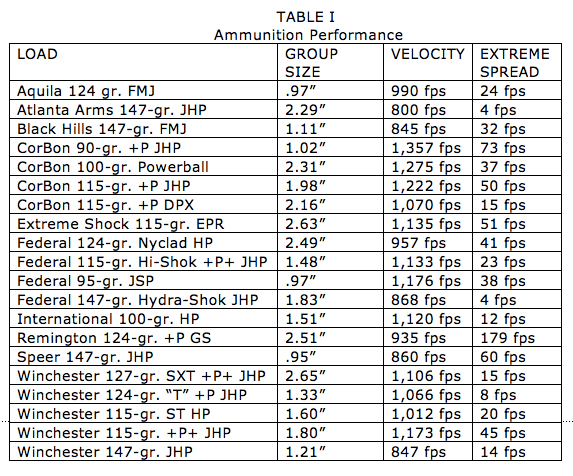 This very stable media enabled me to compare the potential performance of one bullet against the other. First of all, stay away from hollowpoint bullets over 130 grains. The heavier 147-gr. subsonic hollowpoints cannot generate enough velocity in barrels under four inches to expand and zip through 18 inches of Perma-Gel like it isn’t there. If deep penetration to get through heavy layers of clothing is necessary, the heavier bullets will do that, but without any expansion. The 100-gr. International HP fragmented like an M16 rifle within the first six to eight inches, with one .35-caliber fragment reaching 16 inches. Extreme Shock’s 115-gr. Enhanced Penetration Round’s Nytrillium payload disintegrated completely, deposited its polymer nose plug at five inches and left what remained of its jacket at 12-15 inches. I have killed large wild boar with ES in .40 caliber, but others have harvested the tough porker with lesser ES calibers fired from small ultra-compact pistols, so I am convinced of its lethality. The most terminally effective rounds in the Slimline and potentially in other snub-nosed 9mm handguns appear in the accompanying table. Average groups were obtained from five-round strings fired from a handheld rest at 15 yards. Average velocities were also obtained from five-shot strings fired through a Pro Chrono Chronograph 15 feet from the muzzle. Bullet penetration and expansion were acquired by firing into an 18-inch bare block of Perma-Gel test media, five feet from the muzzle. Winchester 127-gr. 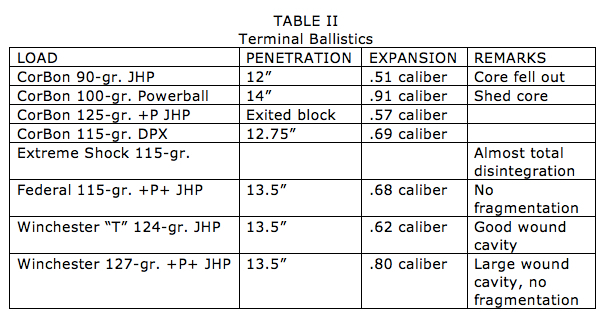 SXT loading penetrated 13.5 inches, expanded to .80 caliber and left large wound channel in block of Perma-Gel. 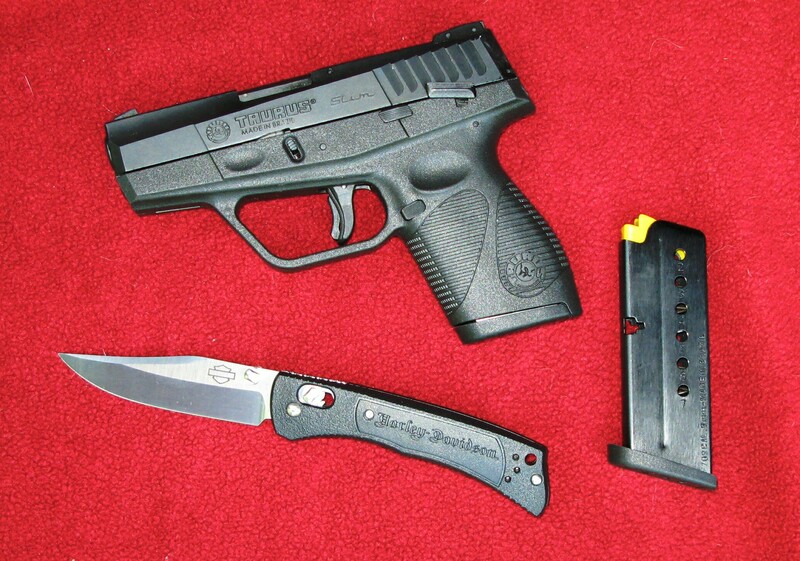 This is the first Taurus that I have evaluated, and I am quite impressed with the pistol. In the past, I had turned up my gunner’s nose when it came to the Brazilian import, but no longer. Compact enough to satisfy the deepest concealment requirements, it possesses good accuracy, unquestionable reliability, sufficient fire sustainability, and it fires a relatively powerful defensive cartridge, albeit somewhat diminished in effectiveness by its stunted barrel. 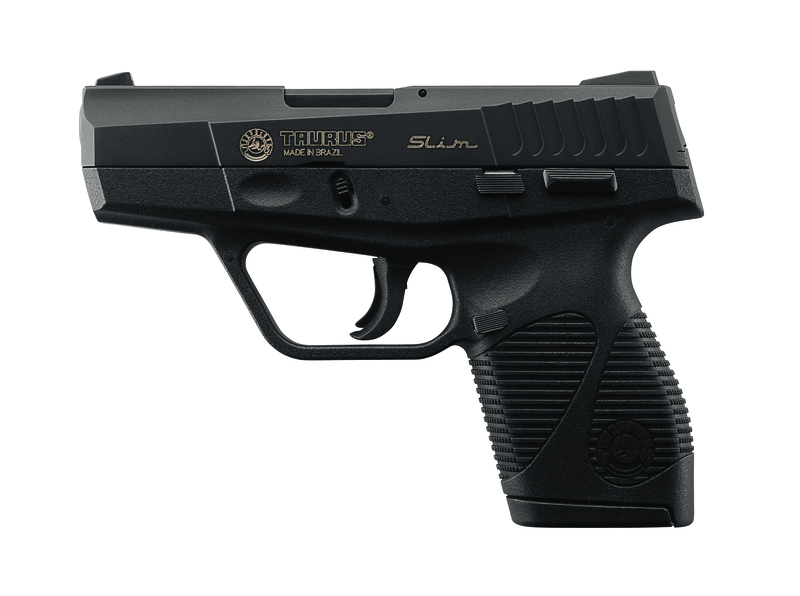 If the nine is not your preference, I am sure that Taurus has bigger-bore plans for the Slimline—and prices that are hard to beat.